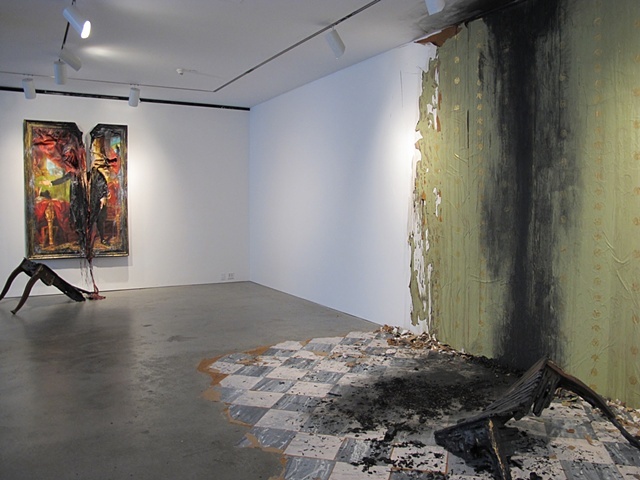 In Headless George Washington with Table (Lansdowne Portrait), 2012, Hegarty creates a scene of fire damage in order to explore the history of portraiture, the intersection between abstraction and figuration and the shifting nature of identity. The installation depicts the famous Lansdowne portrait of George Washington (one version of which was rescued from a fire in the White House during the War of 1812) hanging over a period table. The scene displays a parallel history, one in which the painting did not escape the fire but was melted from the top causing the painting and frame to slump physically toward the center of the painting, along with the painted elements depicted within, such as curtains and columns, that now appear to collapse and drain down through the first presidents body. Headless, as if in rigor mortis, George Washingtons torso retains its leadership pose while an umbilical cord-like stream of paint and canvas flows between his legs as if he is giving birth to the new face of American identity, yet unformed in a smear of color like proto-plasma.